"acanthus." YourDictionary, n.d. Web. 22 April 2019. <https://www.yourdictionary.com/ACANTHUS>. 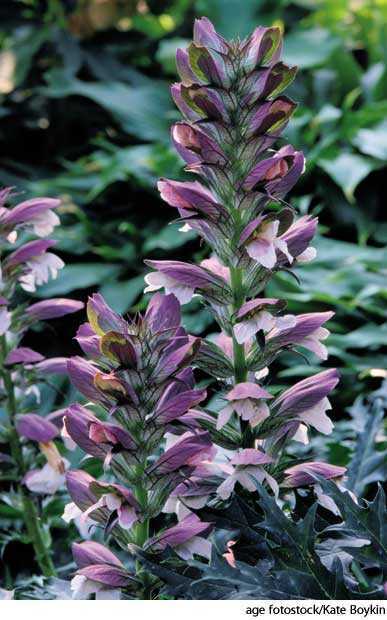 Any of various perennial herbs or small shrubs of the genus Acanthus, native to the Mediterranean and having pinnately lobed basal leaves with spiny margins and showy spikes of white or purplish flowers. Architecture A design patterned after the leaves of one of these plants, used especially on the capitals of Corinthian columns. From Latin acanthus, from Ancient Greek ἄκανθος (akanthos), from ἀκή (akē, “thorn”) + ἄνθος (anthos, “flower”). A taxonomic genus within the family Acanthaceae — prickly herbs that grow in the Mediterranean; the acanthuses. From Ancient Greek ἄκανθος (akanthos), from ἄκανθα (akantha, “thorn”) , from ἀκή (akē, “point”). (zoology) Animal having such a spine. Another species, Acanthus spinosus, is so called from its spiny leaves. Large flowing leaves of acanthus and other plants were beaten out with wonderful spirit and beauty of curve. It has twenty-four columns of Carystian (cipollino) marble, with capitals probably of Byzantine work with swelling acanthus leaves; but the rest of the church is due to native architects. The greater part of its body is covered by a pattern of acanthus leaves, but on the shoulder is a frieze showing nomads breaking in wild mares, our chief authority for Scythian costume.